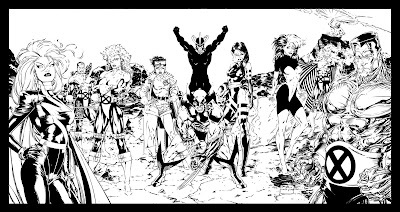 The destruction and revamping of the team leading up to the Mutant Wars and Chris Claremont’s departure from writing the series. Lorna Dane also seemed to have gained the power to catalyse negative emotions. In Uncanny X-Men #257 in 1990, she noticed that she brought forth the worst sides of the people around her, including Legion’s. He had multiple personalities of which the worst was Jack Wayne. He killed Destiny in Uncanny X-Men #255 in 1989 and captured Lorna in #257, intending to take control of everyone on Muir Island through Legion’s telepathic ability. However, in Uncanny X-Men #259 in 1990, the Shadow King possessed Legion and usurped Jack Wayne’s plan. In Uncanny X-Men #269 from 1990, it was revealed that the Shadow King was now in control of Legion and through him everyone else on Muir Island. Obviously, Lorna Dane’s new powers came along before the Shadow King, but when Chris Claremont left the book, subsequent writer Fabian Nicieza attributed the powers to the Shadow King’s influence, so that when Muir Island was freed from his influence in Uncanny X-Men #280 in 1991, Lorna lost her new powers and shrank to normal size. In X-Factor #70 from 1991, written by Peter David, Lorna Dane was back to being Polaris, complete with magnetic powers and completely without explanation, ignoring Claremont’s character development. Another X-Man who was taken in a new direction was Psylocke. In Uncanny X-Men #255 from 1989, the Hand sent her to Spiral’s Body Shoppe, where Mojo and Spiral transformed her body into that of an Asian woman, so she could better serve as The Hand’s assassin in Hong Kong. Although Psylocke had simply been through Spiral’s Body Shoppe like Lady Deathstrike in Uncanny X-Men #205 in 1986, that didn’t stop subsequent writer Fabian Nicieza from writing a complicated story in X-Men vol.2 #21-23 in 1993, where Psylocke had instead switched minds with an Asian woman, Kwannon (Revanche). In X-Men vol.2 #31-32 from 1994 he did add that Spiral had been involved with the body switching, though. In Uncanny X-Men #254 from 1989, the precognitive Destiny had a vision wherein everything was made of the purest crystal. In Uncanny X-Men #255 from the same year, she told Forge that some future elements were obscured in her visions; while others could be perceived so clearly it was as though all eternity had been cast from cut crystal. The crystal in her vision must then have been but a metaphor for a crystal clear future, where the glory that existed in place of all stars and beings - and which finally enveloped her self – was death. A small part of her wanted to deny and fight this destiny, but it was too late to save her self. Throughout the vision she had an hourglass on her forehead with time running out, predicting her own death in Uncanny X-Men #255. In Uncanny X-Men #260 from 1990, pilot Cylla Markham, a friend of Banshee’s, was badly hurt and in Uncanny X-Men #261 that same year, she accepted an offer from Donald Pierce to become one of his cyborg Reavers. In Uncanny X-Men #269, also from 1990, he made her into his new Shullbuster, replacing the one who had died in Uncanny X-Men #255 in 1989. Claremont didn’t get to introduce the finished result before leaving the series, but in Wolverine vol.2 #55-57 from 1992, writer Larry Hama introduced a cyborg created by Donald Pierce that went by the name Cylla. This cyborg bore no resemblance to the new Skullbuster and was killed off in Wolverine vol.2 #78 in 1994. Then, the original Skullbuster reappeared without explanation in the 1997 Domino mini-series written by Ben Raab. When Claremont returned to Marvel, Cylla Markham finally debuted as the new Skullbuster in X-Treme X-Men Annual 2001, ignoring what had happened in between his stints as X-Men writer. In Uncanny X-Men #262 in 1990, Donald Pierce sent his Reavers after his former Hellfire Club colleague Emma Frost, but they never caught up with her. Claremont was building up to a final confrontation between the Reavers and the X-Men, which never happened, because subsequent writer John Byrne had the Upstart Trevor Fitzroy’s Sentinels kill off all the Reavers, except Lady Deathstrike and Cylla Markham, in Uncanny X-Men #281 in 1991. 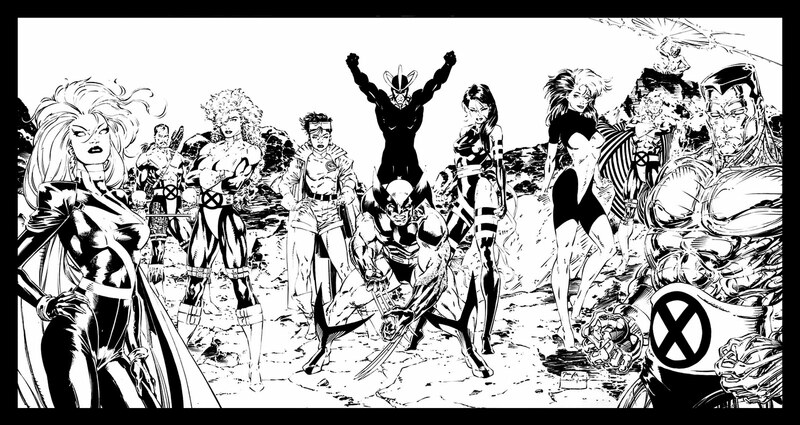 All of them were revived for the X-Treme X-Men 2001 annual, though. In New Mutants #75 from 1989, writer Louise Simonson dropped the first hint to the coming Mutant Wars crossover in the X-Men family of books. Hellfire Club members Sebastian Shaw and Magneto debated the future of mutantkind, with Shaw mentioning various mutant factions and Magneto predicting a war between those factions. The Masque story took place in Uncanny X-Men #262-263 in 1990, but without Dazzler. Forge and Banshee learned that she was alive in Uncanny X-Men #260 that same year, but they never searched her out, and she was suffering from amnesia and didn’t remember the X-Men. “Wolverine, Jubilee and Psylocke also seek their surviving teammates,” Marvel Age Preview #1 stated. Colossus did meet X-Factor in X-Factor #54 in 1990, but in a different story. But Uncanny X-Men #271 featured a “The X-Tinction Agenda” crossover instead. What happened to “The Mutant Wars” is a big mystery. In Uncanny X-Men #279 from 1991, Shadow King was in need of a new host body and had several candidates in mind. Who Claremont had intended for him to possess until the final battle with Professor Xavier in Uncanny X-Men #300 in 1993 remains unknown. Claremont left the X-Men with Uncanny X-Men #279, right in the middle of the Muir Island Saga, which featured Shadow King. All of Claremont’s story-elements were dropped between page 12 and 13 of that issue, and new writer, Fabian Nicieza, cut the Shadow King storyline short by having Professor X defeat him in the very next issue. “My Muir Island story was much different from the one that appeared,” Claremont stated in a 1994 Internet interview. “What happened was that the editor of the book and I had for a long period of time leading up to that point increasingly disagreed on the direction the book should go in – how the book should be handled,” Claremont told Seriejournalen.dk. That year, in 1991, Fabian Nicieza wrote the “Kings Of Pain” crossover in New Mutants Annual #7, New Warriors Annual #1, Uncanny X-Men Annual #15 and X-Factor Annual #6 featuring the new villain Harness (Erika Benson) and her son Piecemeal (Gilbert). Harness was working for the A.I.M. organization and it was revealed that she also had a seven years old daughter who was in the care of A.I.M. However, Harness never appeared again, and her daughter never appeared anywhere at all. Great job unearthing the long overlooked "Mutant Wars". It is interesting that in the lead-up to X-Tinction Agenda, the original solicit for Uncanny X-Men #271 mentioned our merry mutants battling "Living Sentinels" which we never saw!? Was Cameron Hodge's co-opting of Warlock's Transmode Virus going to result in the creation of something akin to the Phalanx a few years earlier? What was it that Claremont said about his plots later showing up in some altered form... Although why the Genoshans would require Warlock to obtain the Transmode Virus when the Genegineer obviously had some form of it for the mutate "Transmodation Process"! Then there's the Upstarts who were originally planned as the Wild Boys, who in addition to Shinobi Shaw, Matsuo Tsurayaba, Fenris and Fabian Cortez would have included Mr. Sinister instead of Gamesmaster (hence the later reveal that he was really a child), Ahab instead of Trevor Fitzroy (who would have transformed the surviving Morlocks into his Hounds), and Zaladane instead of Siena Blaze. It was at a convention in 1991 and pretty sure it was Lysa Hawkins who advised. Interesting that so many people seem to understand that Psylocke was sent to Spiral’s Body Shoppe, when it's kind of obvious that that part of the story was an illusion created by the Hand to brainwash Psylocke (just like she didn't really killed the X-Men in that issue, it was just a dream/illusion). Nicieza also seems to have read this issue with little attention, since it's obvious that the hand only changed a few traits of Psylocke's body, and that's why Wolverine is able to recognize Betsy's face, next issue. That wouldn't be possible if she had switched body with someone else. So...Any chance to see a new season of X-MEN FOREVER?